IOTA is organizing monthly Social Mixers starting this summer. The upcoming one will be scheduled at Aug-2, Sep-5, and Oct-4. Block your calendar now! 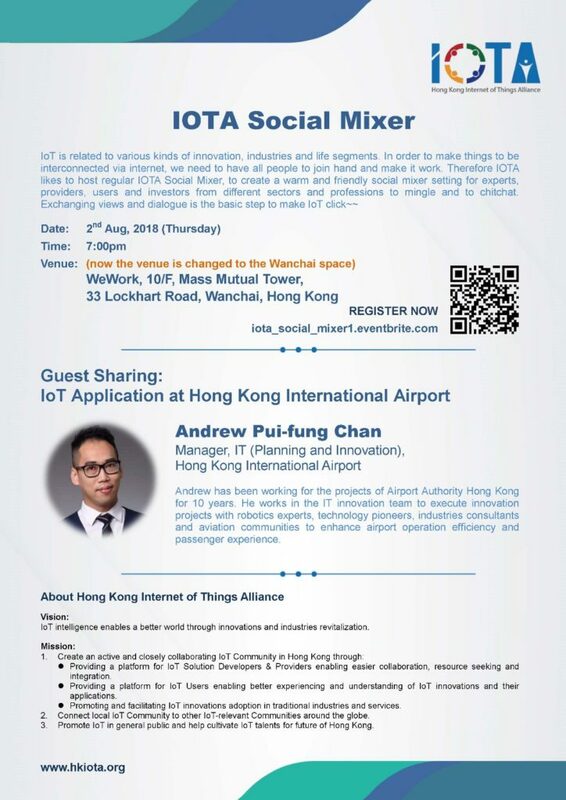 Our new corporate member Airport Authority Hong Kong will also have their representative Andrew Chan sharing IoT Applications at the airport with us. Andrew has worked for projects of Airport Authority Hong Kong for 10 years. He works in the IT innovation team to execute innovation projects with robotics experts, technology pioneers, industries consultants and aviation communities to enhance airport operation efficiency and passenger experience.